Looking NE from corner of Pantry to opposite corner of kitchen/scullery (being excavated). A sunny day, with some archaeological ups and downs. Looking S from W side of front gateway towards front of house. We worked on both ends of a 1x3m trench which was 2m south of the front garden gate, the southern most 1m of which was over the front wall of the house. 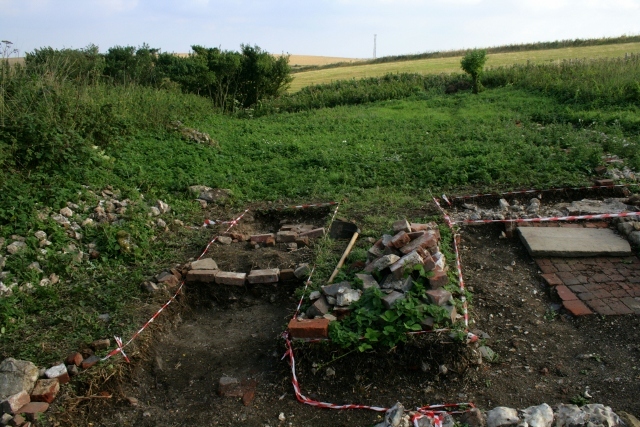 The main purpose of this trench was to find the ‘well’ which the last residents of the cottage (Peggy’s family) have said was directly outside the kitchen window, to the east of the front door. On excavating the northern 1m of this trench down to the ground surface immediately below the WW2 demolition rubble, there was no sign of any well or related structure. Looking W from door of ‘woodshed’ at brick quoin of junction with kitchen/scullery front wall. 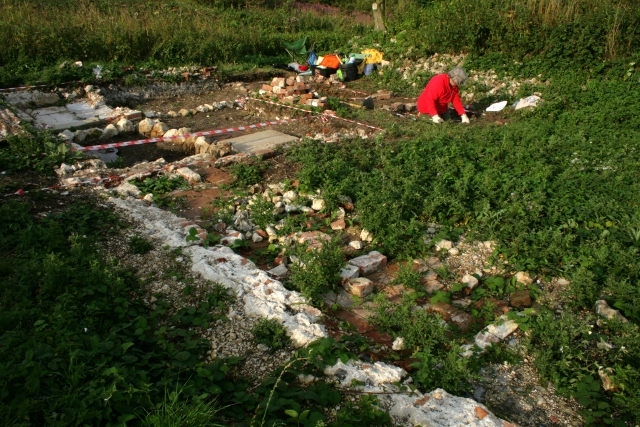 The southern most 1m of the trench revealed the eastern corner of the Phipps and Latham family’s kitchen. 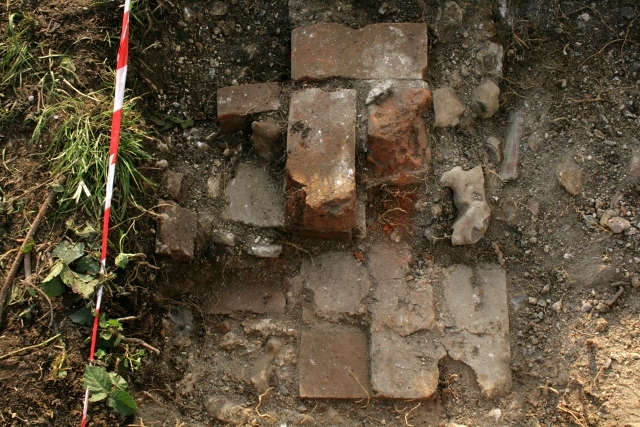 A very nice T-shaped brick quoin (in an otherwise flint built wall) was discovered which would have been built to strengthen the junction of the north and east walls of the kitchen and that of a ‘wood store’ which was at the eastern end of the gable frontage of the house, adjacent to the kitchen. This moves the location of the kitchen window further west than we thought. 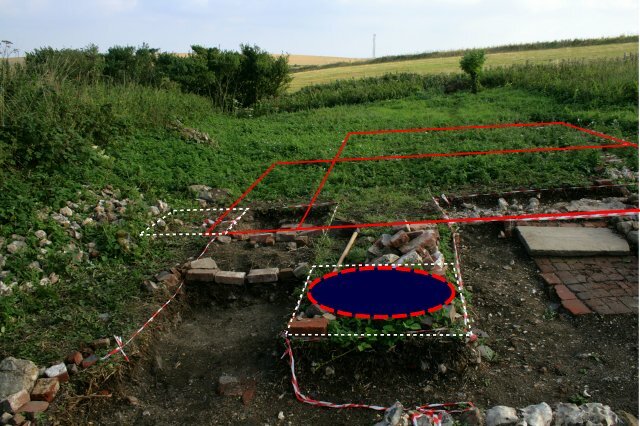 Photo of excavation looking S overdrawn with plan-lines showing known and probable wall lines, grid squares to be excavated and possible location of a well. Excavation plan (orientated N at top) showing main excavated areas – dark shaded; main excavated wall lines – red; possible wells – dashed circles; minimum of 1 x 1m grid sq.s planned to be excavated – dashed green lines. Base plan from ESRO. 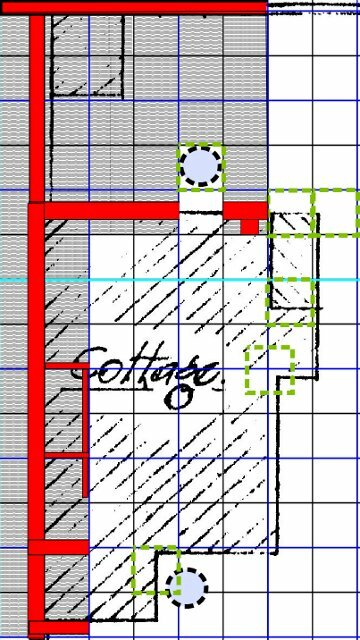 This meant that the kitchen was slightly narrower than a surviving plan had indicated, and that the kitchen window would have been further west than we thought. So this Friday we plan to start excavating the last 1m wide baulk of soil left to be dug in front of the house. Amongst the usual metal, glass, and ceramic finds we had some very nice decorated ceramics, including the arm of doll which had a looped hole for attachment to the rest of her body. A very special reminder that at least some of the families gave their children toys (Peggy and her older sisters had none bought for them). Friday’s weather looks like it will be mostly cloudy, but should stay dry. We will be at the car park near the junction of Bexhill Road and Falmer Road, just north of Woodingdean, at 10am. Even if it is too wet to dig we would be happy to give a quick guided tour for anyone interested.